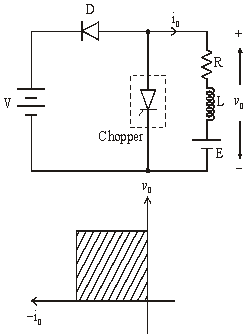 â€¢ When chopper is ON, supply voltage V is connected across the load. â€¢ When chopper is OFF, vO = 0 and the load current continues to flow in the same direction through the FWD. â€¢ The average values of output voltage and current are always positive. 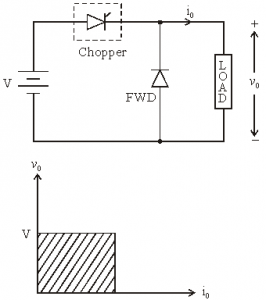 â€¢ Class A Chopper is a step-down chopper in which power always flows form source to load. â€¢ It is used to control the speed of dc motor. 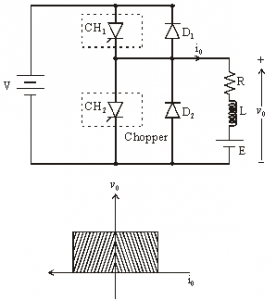 â€¢ The output current equations obtained in step down chopper with R-L load can be used to study the performance of Class A Chopper. Figure below shoesÂ Class A chopper. â€¢ When chopper is ON, E drives a current through L and R in a direction opposite to that shown in figure. 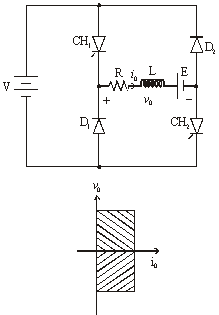 â€¢ During the ON period of the chopper, the inductance L stores energy. â€¢ When Chopper is OFF, diode D conducts, and part of the energy stored in inductor L is returned to the supply. â€¢ Average output voltage is positive. 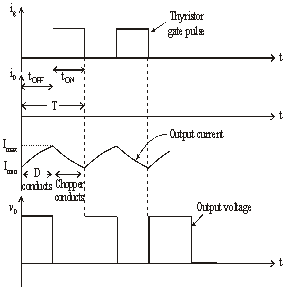 Average output current is negative. â€¢ Therefore Class B Chopper operates in second quadrant. 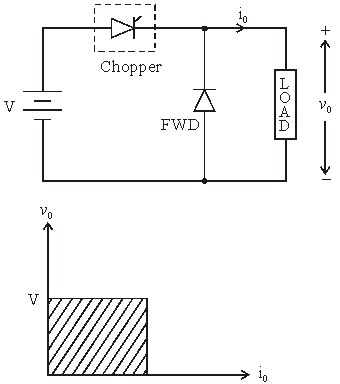 â€¢ In this chopper, power flows from load to source. â€¢ Class B Chopper is used for regenerative braking of dc motor. Figure below shoesÂ Class B chopper. â€¢ Class C Chopper is a combination of Class A and Class B Choppers. â€¢ For first quadrant operation, CH1 is ON or D2 conducts. â€¢ For second quadrant operation, CH2 is ON or D1 conducts. 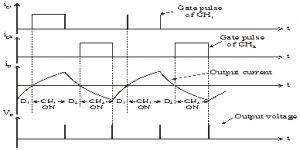 â€¢ When CH1 is ON, the load current is positive. â€¢ The output voltage is equal to â€˜Vâ€™ & the load receives power from the source. 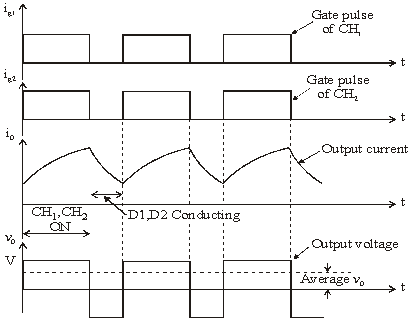 â€¢ When CH1 is turned OFF, energy stored in inductance L forces current to flow through the diode D2 and the output voltage is zero. â€¢ Current continues to flow in positive direction. 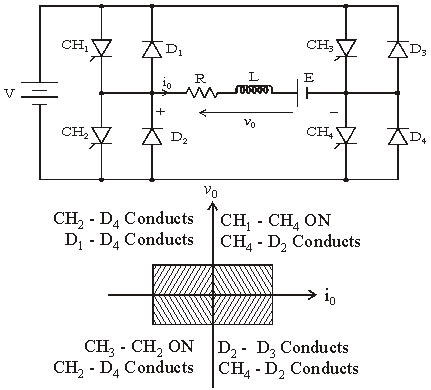 â€¢ When CH2 is triggered, the voltage E forces current to flow in opposite direction through L and CH2 . â€¢ The output voltage is zero. â€¢ Output voltage is V, the input current becomes negative and power flows from load to source. 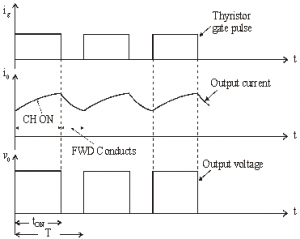 â€¢ Average output current can take both positive and negative values. â€¢ Choppers CH1 & CH2 should not be turned ON simultaneously as it would result in short circuiting the supply. â€¢ Class C Chopper can be used both for dc motor control and regenerative braking of dc motor. Figure below shoesÂ Class C chopper. â€¢ Class D is a two quadrant chopper. 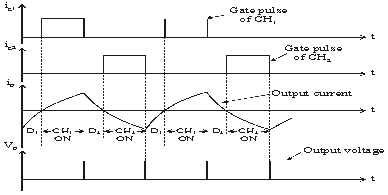 â€¢ When both CH1 and CH2 are triggered simultaneously, the output voltage vO = V and output current flows through the load. 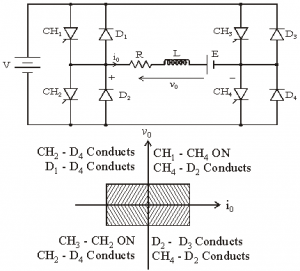 â€¢ When CH1 and CH2 are turned OFF, the load current continues to flow in the same direction through load, D1 and D2 , due to the energy stored in the inductor L.
â€¢ Output voltage vO = – V.
â€¢ Average output voltage becomes negative if tON < tOFF . 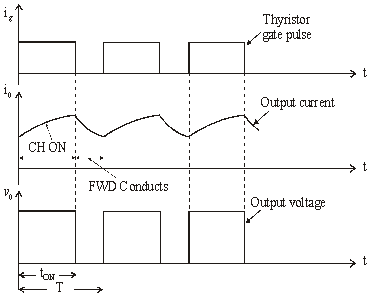 â€¢ Hence the direction of load current is always positive but load voltage can be positive or negative. Figure below shoesÂ Class D chopper. 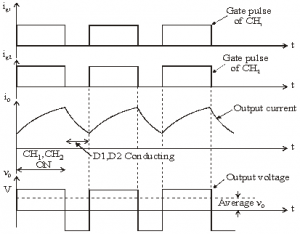 â€¢ When CH1 and CH4 are triggered, output current iO flows in positive direction through CH1 and CH4, and with output voltage vO = V.
â€¢ This gives the first quadrant operation. â€¢ When both CH1 and CH4 are OFF, the energy stored in the inductor L drives iO through D2 and D3 in the same direction, but output voltage vO = -V.
â€¢ Therefore the chopper operates in the fourth quadrant. â€¢ When CH2 and CH3 are triggered, the load current iO flows in opposite direction & output voltage vO = -V.
â€¢ Since both iO and vO are negative, the chopper operates in third quadrant. â€¢ When both CH2 and CH3 are OFF, the load current iO continues to flow in the same direction D1 and D4 and the output voltage vO = V.
â€¢ Therefore the chopper operates in second quadrant as vO is positive but iO is negative. Figure below shoesÂ Class E chopper.